Chapter 1: What are Office 365 Groups? Chapter 2: What is Microsoft Teams? Chapter 3: What collaboration tool should I use when? Office 365 and Microsoft Teams makes it easier than ever for end users to create a Group and start collaborating. But what happens to all that valuable data when an end user deletes the Group? How can you track and manage a Group through its lifecycle to ensure content is properly protected, retained or archived? What is the best way to articulate the differences between the tools so your team can best use them to collaborate seamlessly? 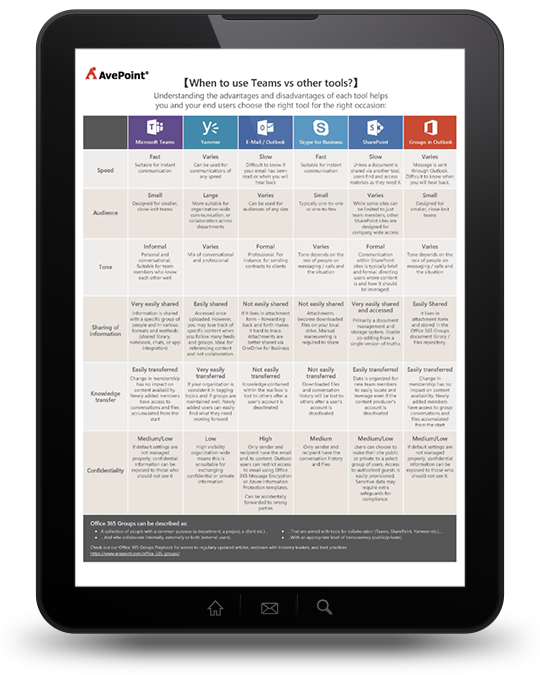 Whether you are an Office 365 admin, IT pro, or a business leader this guide is for you. Learn solutions to common management and governance concerns for Office 365 and Microsoft Teams. "In the past, the IT department had to grant and manage permissions for these workloads separately. This would take administrators a significant amount of time to configure. Office 365 Groups now combines these repetitive tasks into one." Chapter 1: What are Office 365 Groups?